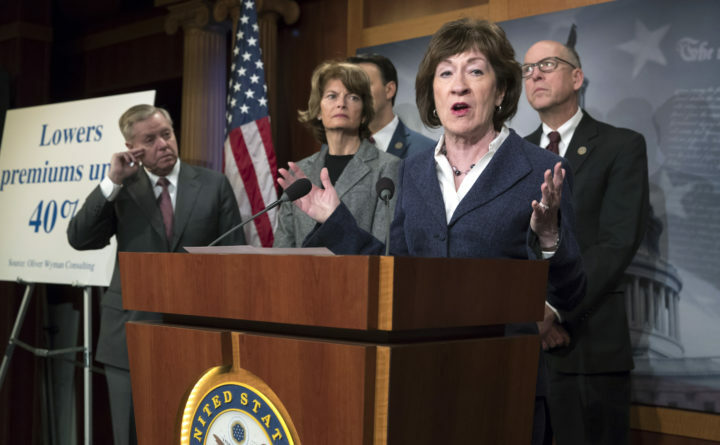 File photo from March 21, 2018 of Sen. Susan Collins, R-Maine center, joined by, from left, Sen. Lindsey Graham, R-South Carolina, Sen. Lisa Murkowski, R-Alaska, and Rep. Greg Walden, R-Oregon, at a press conference aimed at including healthcare provisions in the federal government spending bill. The provisions ultimately weren't included in the federal budget. U.S. Sen. Susan Collins says she doubts Congress will take action any time soon to stabilize the Affordable Care Act (ACA) marketplace. Her proposal to lower health insurance costs was not included in the omnibus spending bill passed last month, and Collins now says she’ll refocus her strategy. Speaking at the Barbara Bush Children’s Hospital in Portland where she received a public service award from the American Academy of Pediatrics, Collins said that, inevitably, Congress will need to do something to prevent the ACA marketplace from collapsing in some states, but she doesn’t think it will happen in time to prevent insurance rates from going up next fall. “I’m not optimistic that will happen, and I really worry about self-employed individuals who really will struggle to pay for insurance or be forced to be uninsured,” she said. Maine has seen double-digit insurance premium increases for ACA marketplace plans for the past two years. Those who receive subsidies are shielded from those increases. But those who earn more than 400 percent of the federal poverty level – about $48,000 per year for an individual – don’t qualify for subsidies and have to absorb the cost. Collins says she’ll now look to other ways to lower health care costs. She’s introduced two bipartisan bills that she says could help patients get the lowest price possible for prescription drugs.